Bethesda’s latest game uses an updated version of the Gamebryo engine (Oblivion). This benchmark takes place immediately outside Vault 101. The character walks away from the vault through the Springvale ruins. The benchmark is measured manually using FRAPS. 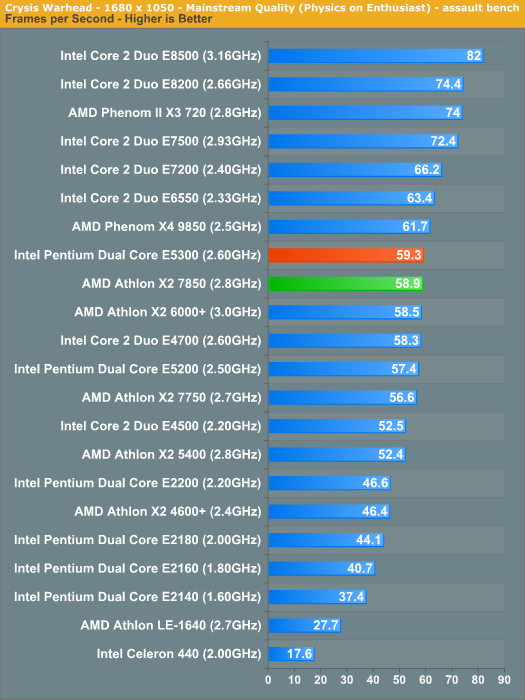 While Intel held the lead for video encoding, 3D rendering and nearly all other performance tests - AMD manages over a 7% advantage under Fallout 3. AMD’s gaming advantage continues as it outperforms the E5300 by nearly 24% in Left 4 Dead. Intel has the cache advantage but the X2’s lower memory latency helps it out in our gaming tests. FarCry 2 ships with the most impressive benchmark tool we’ve ever seen in a PC game. Part of this is due to the fact that Ubisoft actually tapped a number of hardware sites (AnandTech included) from around the world to aid in the planning for the benchmark. 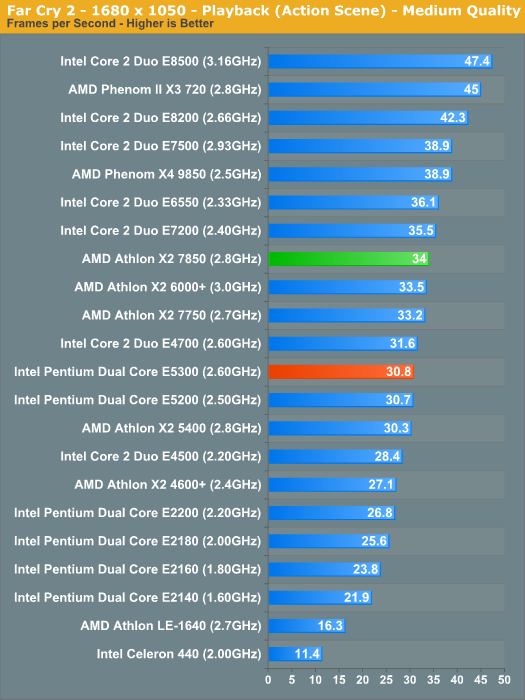 AMD continues to lead in gaming performance in Far Cry 2; this time by 10%. 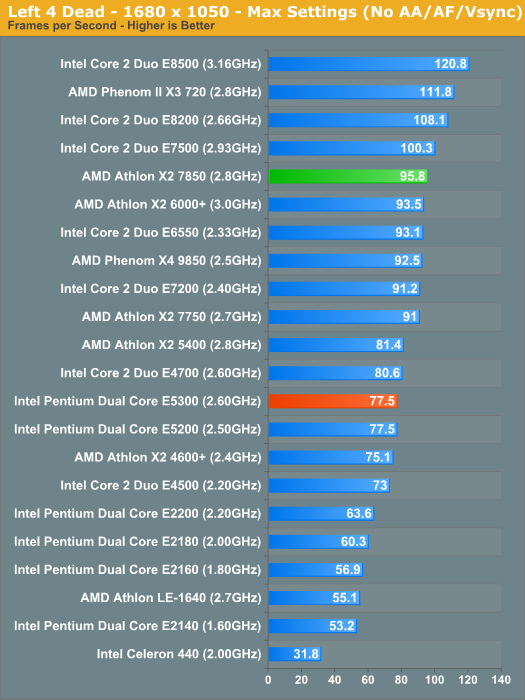 In its only gaming performance lead of this comparison, the E5300 is barely faster than the X2 7850. 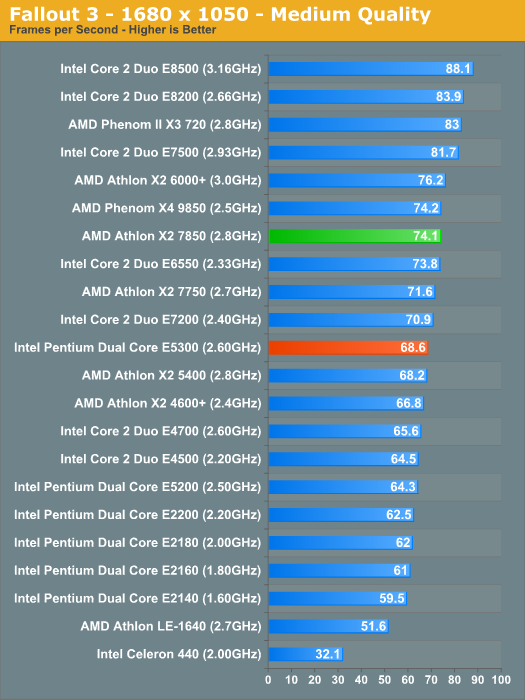 The overall verdict though is if you’re strictly gaming, the Athlon X2 7580 is a better buy.